Challenge: For student to create a working draw and iPad stand combination. Background: Student inspired by other versions of these produced in the classroom, attempted to produce a delux version of this project. 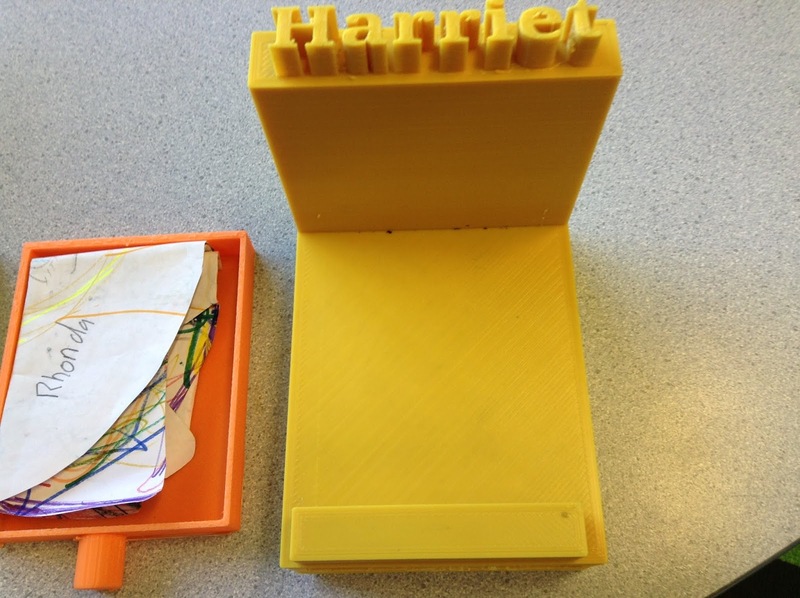 The aspects that the student wanted to cover were having the iPad stand clearly personalised, with their name featuring on it prominently, having it function as a working iPad stand to use as a iPad Mini. In addition to that the design also was to feature a draw at the base of the design, the draw needed to work in conjunction with the base. The intention of the draw was to provide the opportunity for storage. The project was completed by a ten year old student who was working with the 3D Printer for the second year. Level of Difficulty: High - for the project to work the student worked completly independently of the teacher. 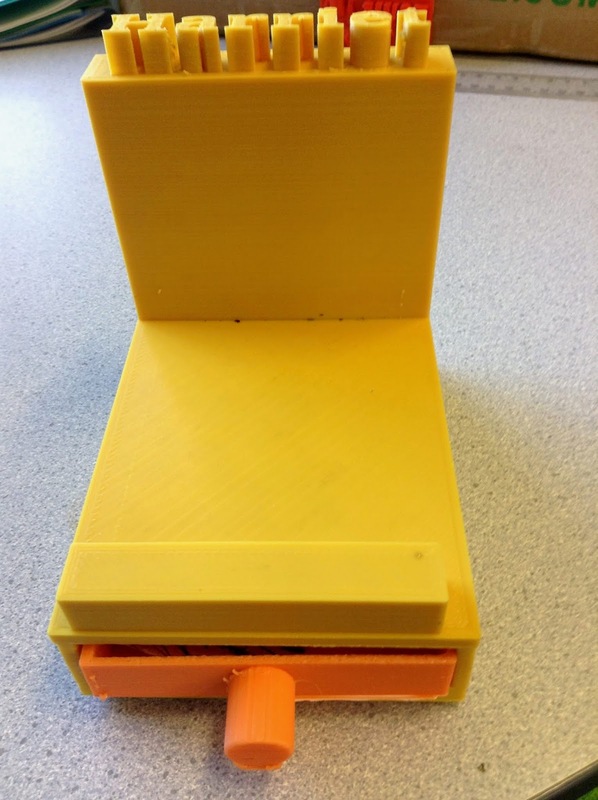 She had to have three attempts at the draw, which will be retained for use with other projects, however this resulted in a basic measuring error by the student. Timeframe: Twenty hours for the base and three hours for the draw. Size: The dimensions of the print were 95mm across, 125mm long and 35mm high. There was a lip on the front of the design which essentially was a 10mm by 10mm rectangular block, which run along the front of the design. The back of the design was 110mm high, 15mm thick. The lettering stood out 10mm from the top of the design, which allowed the name to feature prominently. The draw measured 83mm across, 105mm long and 15mm high. Significantly it had a width of 3mm. It fitted extremly well within the confines of the base of the design and allowed the draw to be accessed easily. For this project to work these dimensions were the mimimum that would be required. What we would do differently: The project was extremely successful, with the small matter of the reprints required to match the base with the draw. However the draws are destined for another project and will still be used with a project. Next steps for the student: To move on to other projects, this has been completed successfully.